Building on almost a decade of advocacy work, the Canadian Federation of Agriculture is seizing an unprecedented opportunity to make sure that the vital role of farmers is enshrined in a government initiative to create an over-arching Canadian policy on food. The Minister of Agriculture and Agri-Food is progressing toward the 2018 launch of A Food Policy for Canada — reflecting a key priority listed in his official mandate letter from Prime Minister Justin Trudeau. The momentum has never been stronger, and CFA is proud to be leading discussions on how to create an effective food policy, one that will support ambitious economic growth targets while integrating food security, health and safety, and environmental sustainability. CFA believes that to move forward on creating a national food policy, both a long-term vision and short-term actions are required and through our recent collaborations on this topic, we have found that many organizations share this view. Based on conversations during industry events, government meetings, as well as ongoing outreach with civil society, indigenous groups and academia, we’ve developed recommendations that will feed into the government’s policy making process. We presented these recommendations during the government consultation and at a recent hearing of the House of Commons Standing Committee on Agriculture and Agri-Food. 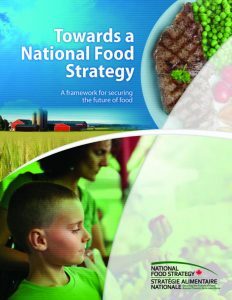 In 2011, CFA published Toward a National Food Strategy (NFS), a discussion paper focused on the long-term. The NFS recognizes that short-term, band-aid solutions are not enough for the lasting and evolving challenges we face today. The industry has taken steps in moving towards finding broader solutions for the value-chain, taking into account everything from promoting the Canadian brand and healthy lifestyles to sustaining economic growth and ecosystems. The NFS was developed by the agriculture and agri-food industry to ensure a more holistic and strategic approach to food and agriculture to meet the needs of the food system and future generations, as well as the global community. The NFS is meant to help guide policy development and is built around nine strategic objectives that the food system must meet to feed our growing population – domestic and abroad – and to manage our food system sustainably.